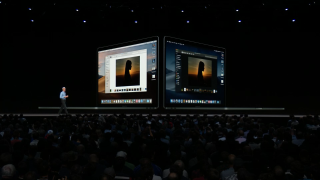 Apple revealed its latest version of its macOS operating system, macOS 10.14 Mojave, at its WWDC 2018 conference, and we’ve now got a glimpse of some of the new features that the updated Mac operating system will bring. This is because the macOS 10.14 Mojave Developer Preview is available to download and install right now. The Developer Preview is a very early version of the software, so we wouldn’t recommend most people download it. However, if you really want to know what new features are coming, other people, such as 9to5mac, are kindly sharing their experiences and highlighting the new features that are present in macOS 10.14 Mojave. One of the first things you may notice when you boot up macOS 10.14 Mojave is that the lock screen has had a bit of a tweak, with larger images and font text. This is a bit of a curious one, as the idea of playing DVDs on a PC feels a bit archaic these days, but in macOS 10.14 Mojave, Apple has updated the DVD Player app. It’s now 64-bit and built with AppKit, and has Touch Bar control and a brand new icon. Safari, Apple’s internet browser, will now support website Favicons in tabs. These are icons of the website’s logo that are designed to make quickly switching between the correct tabs easier. At the moment it looks like Favicon support is turned off by default in macOS 10.14 Mojave, but can be turned on from the Safari Preferences screen. We already knew that macOS 10.14 Mojave would come with a new night mode, and it also looks like you can choose your own color accent from the System Preferences screen. The colors on offer include blue, red, orange, green, purple, pink and gray. These color accents will affect various parts of the operating system such as menus and mouse clicks. If you’re looking to update macOS 10.14 Mojave you’ll notice that the Software Update tool is no longer where it once was. It’s now returned to the System Preferences app. Apple said that it was getting serious about security with macOS 10.14, and it looks like it was true to its word. So, macOS 10.14, like iOS 12, will support automatic strong passwords by default, with Safari automatically creating (then auto-filling) strong passwords for you, which it will also store. It will also alert you to any existing passwords that could be too easy to crack. As Apple releases more early versions of macOS 10.14 Mojave, we’ll get a better idea of what new features we can expect when the final version of the operating system arrives later this year.